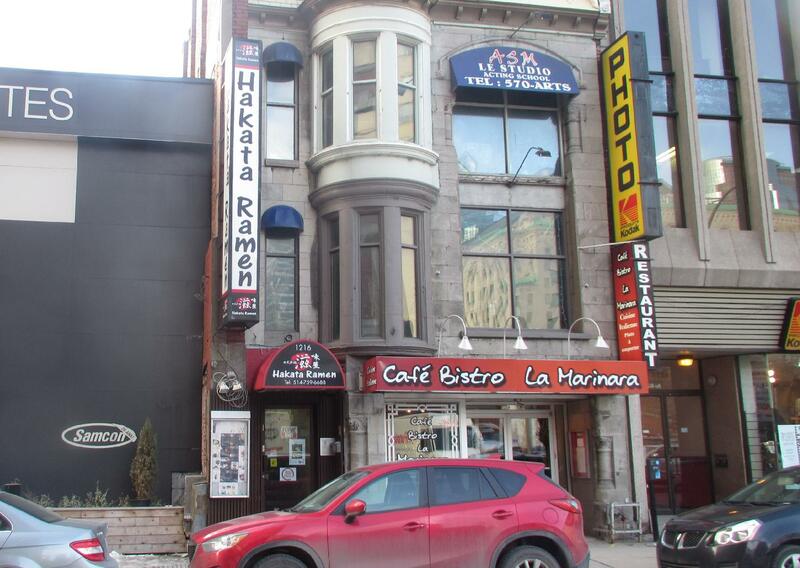 The restaurant is located on the second floor of a shotgun narrow building but it is a bit larger than one would expect from the outside and it seats somewhere in the region of 80 to 100 patrons. It is simply, almost spartanly appointed, with just a few adornments on the walls, but it is clean and comfortable and has a nice atmosphere with soft lighting and a plain, minimalist sort of elegance. The service, while neither friendly nor unfriendly, is polite and efficient and I found that the waitresses had an uncanny ability to materialize within minutes of me finishing a dish, ready to take my next order. 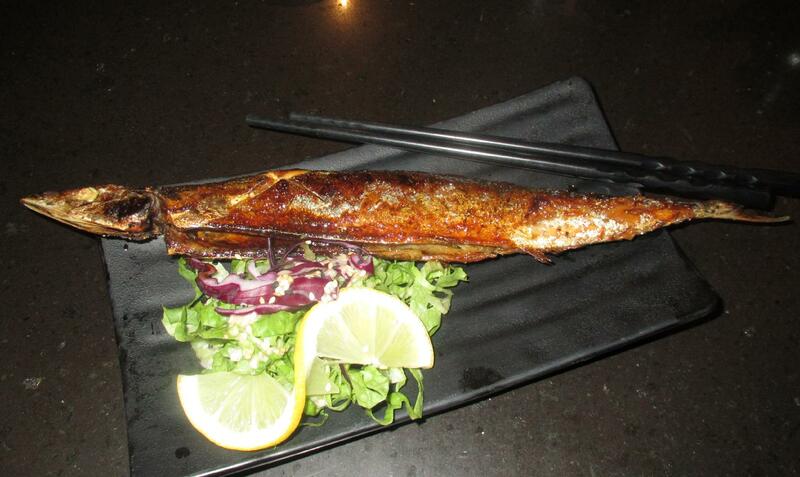 Grilled Saba – ‘Saba’ is actually a generic Japanese word for Mackerel but the fish served here is a relative, most commonly called ‘Sanma’ on Japanese menus, but also known in English as ‘Pacific Saury’, or ‘Mackerel Pike’ . This selection was fairly good but, although the flesh was tender and nicely sweet, the skin had a bit of a bitter taste, especially where it had been charred. It was lightly glazed with a sweetish sauce that had a bit more of an umami quality that the usual ‘Teriyaki’ style preparation and may have been a Kabayaki Eel Sauce. I quite enjoyed this but it was not as good as a better version I enjoyed in Ottawa last year and I gave it just a 2 out of 5. 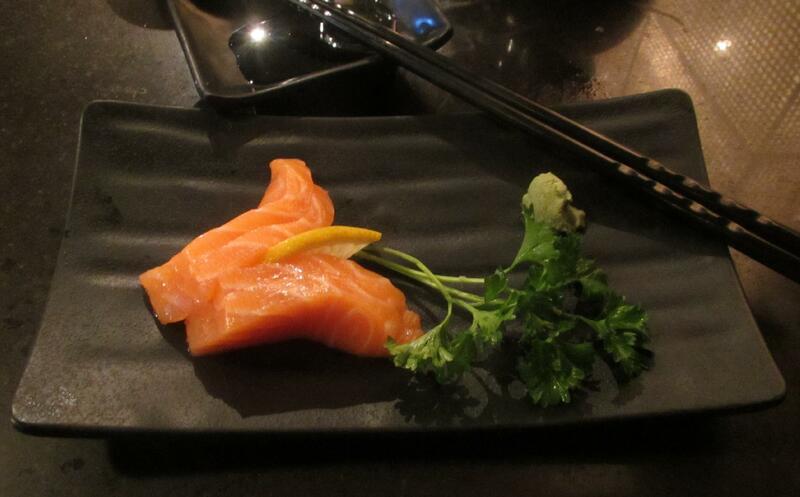 Salmon Sashimi – The presentation here was not especially artful but the taste was excellent. The flesh was sliced very expertly, which is essential for sashimi to shine, and the texture was silky and the flavor fresh and bright. It was accompanied, as is usual, with a little Wasabi and Soy Sauce for dipping and there was a thin slice of lemon on the plate. I don’t usually bother with Wasabi but I found that just rubbing each slice along the lemon slice before dipping in soy made for a nice little enhancement. I gave this dish a solid 4 out of 5. 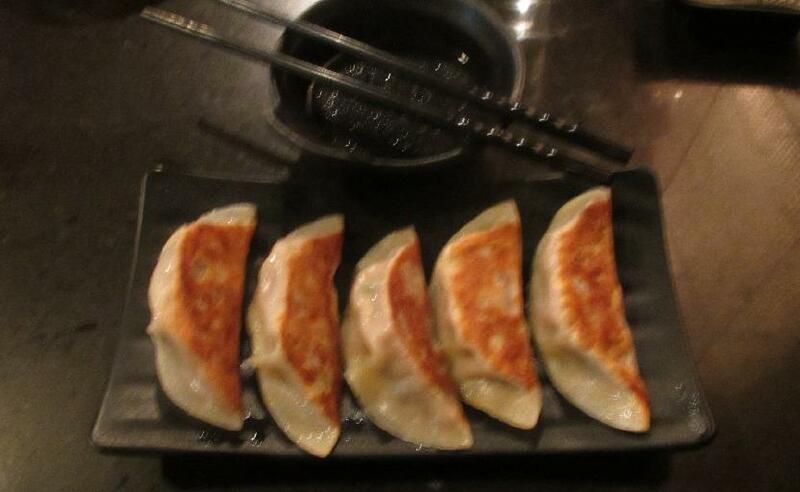 Gyoza – These were not only the largest, but also the best Gyoza I have had in a restaurant. They were very well formed and fried and the pork filling was both juicy and tasty. They were served with a dipping sauce composed of soy, rice vinegar and ginger, but I supplemented this with some of the chili oil that is supplied to each table. The only aspect of this I didn’t like was that the filling contained cilantro, which I don’t care for. But this is a matter of personal taste and didn’t diminish the quality. I gave these an unstinting 5 out of 5. 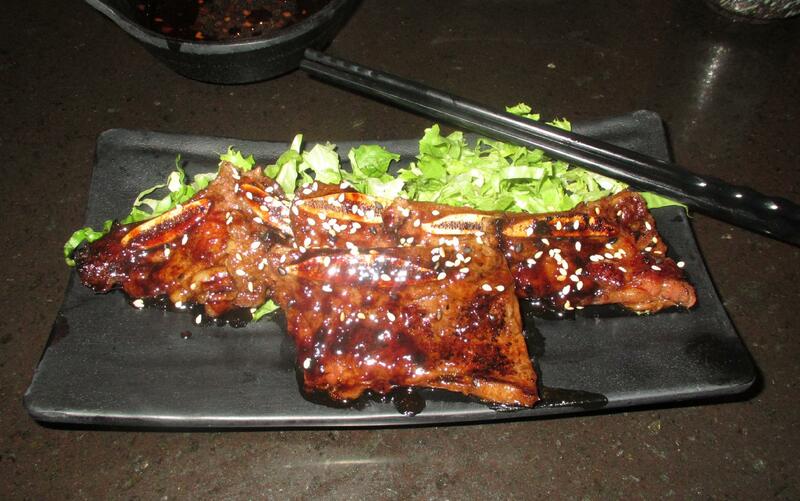 Japanese Beef Short-rib – This was one of the Korean influenced dishes on the menu and it was very good on the whole. The meat was nicely charred but still rare in the center, which is quite tricky with such a thin cut. The Teriyaki style glaze was a bit oversweet but when I dipped it in some of the sauce I kept from the Gyoza serving, I found the vinegar balanced this out. I prefer my own variations on this dish but this was still good and I gave it a 4 out of 5. 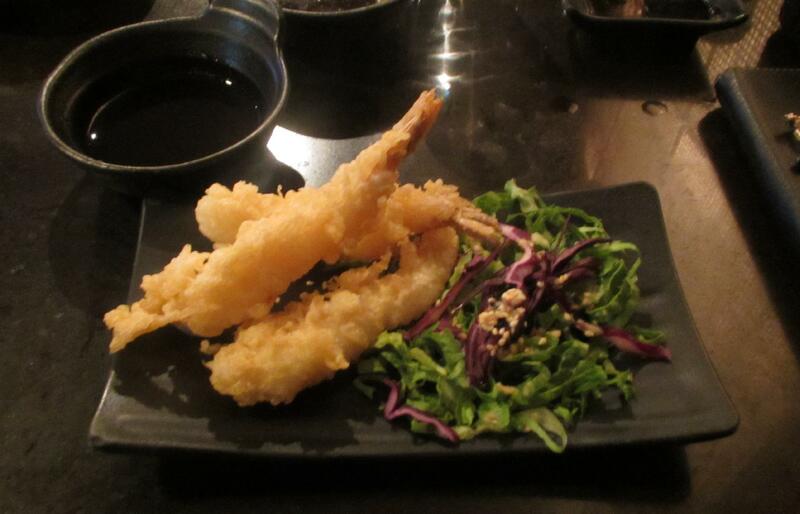 Shrimp Tempura – Of all the selections I sampled on this visit, the tempura were the only disappointment. The batter coating was somewhat greasy and a little soft in places and I rather think that the frying temperature was a bit too low and the oil none too fresh. It is a shame that Hakata managed to do such a poor job on this standard of Japanese restaurants but maybe I just caught them on a bad night for tempura. I rated it at only a 1 out of 5. Despite one disappointing dish, I thoroughly enjoyed my dining experience here. 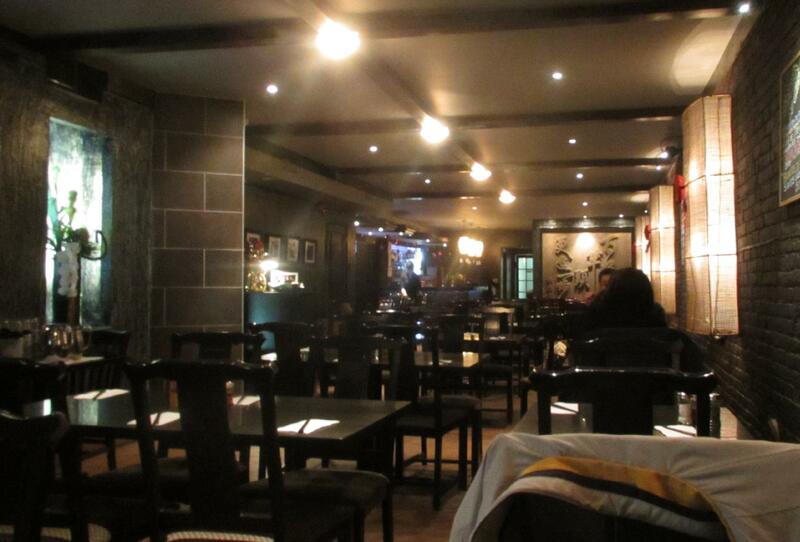 The service was generally good, the atmosphere pleasant, and most of the food excellent. There are plenty of other selections I would like to try and I will happily return sometime. Rating: 4 out of 5.